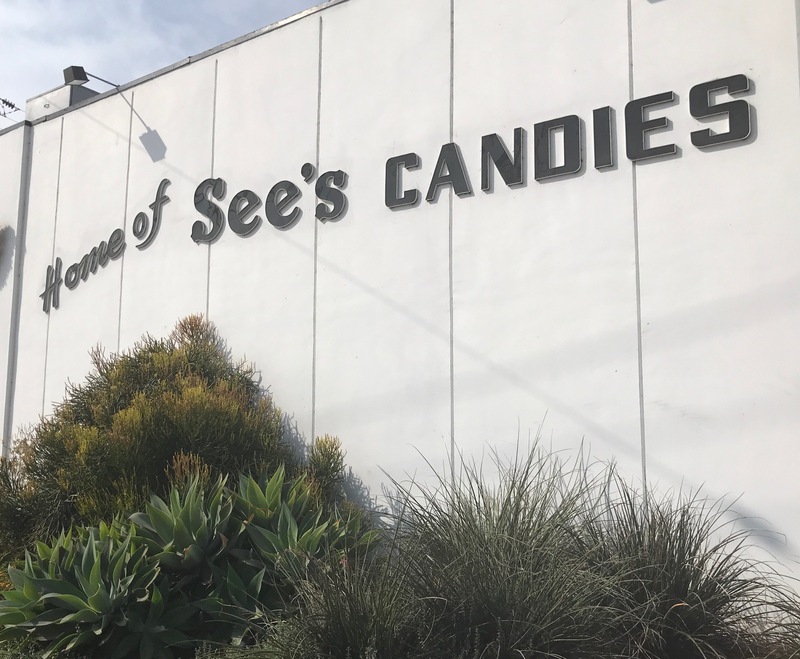 Meeting Dave Chapman Production Coordinator at See’s Candy Corporate office in Los Angeles, I “robed up” in a white See’s Candy jacket and donned a blue hair bonnet before he escorted me into one of California’s most beloved chocolate and candy companies. It’s almost been 100 years since Mary See started making candy back in 1921. 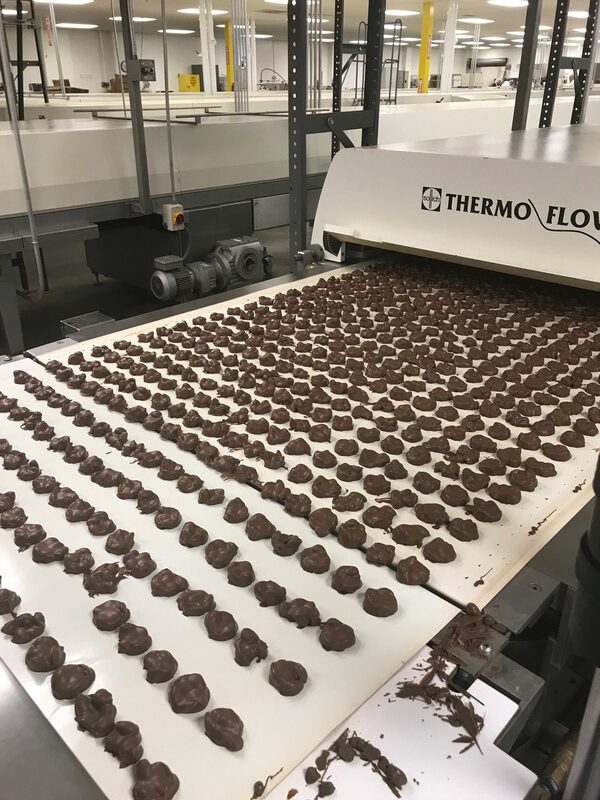 Today the privately held company makes over 100 different chocolate candies and has 260 stand-alone iconic black-and-white checkered floor shops. What people love when walking into a See’s Candy Shop is receiving a complimentary candy as a welcome treat. The first thing I noticed on this private tour (not open to the public) is how clean each room is in the facility. 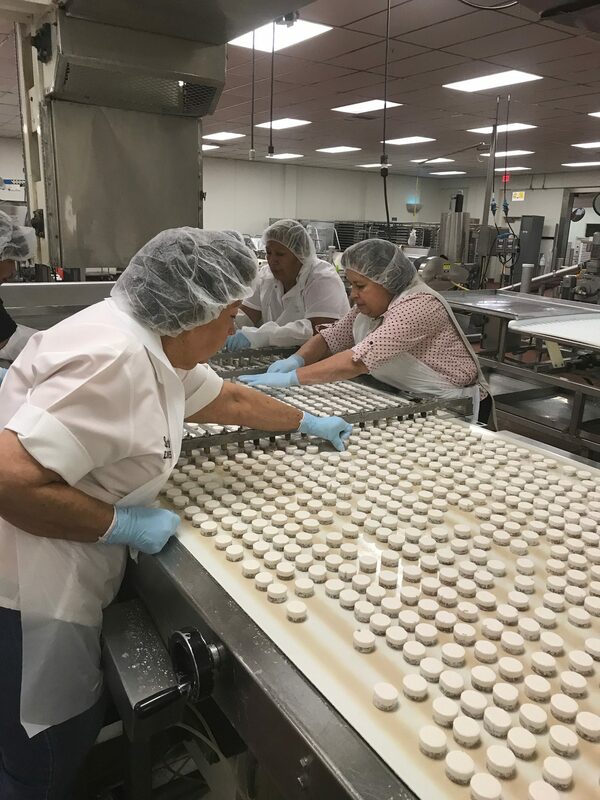 One of the first areas we approached was the pre-coating machine that places the first chocolate coating on a bright white marshmallow to make Scotchmallow candies. “This facility is over a football field in length,” said Chapman. Their popular Scotchmallow candy is made with in-house honey marshmallow and vanilla caramel before being dipped in dark chocolate. They also make Scotchkisses made with honey marshmallow and a lighter caramel. “Our honey is a buckwheat honey, we add a little orange and soft marshmallow,” said Chapman as he handed me one. While touching the center I noticed was soft it was when I pushed down. It’s hand-made, hand-dipped and then boxed. The next candy station had a group of ladies hand topping chopped almonds on solid medallions of Victoria Toffee. It reminded me of the iconic I Love Lucy episode where Lucy and Ethel go to work in a candy factory while Ricky and Fred do their housework. “Lucille Ball and Vivian Vance trained here before filming that chocolate factory episode,” Chapman told me. Chapman told us that chocolate is the most expensive ingredient in the candy, so they make sure none of the dark liquid stored in 80,000 pound tanks goes to waste. A blower takes the excess chocolate off the candy and it drips down in wells; then it’s piped and recirculated to be reused. See’s chocolate is perfectly tempered so it won’t immediately melt in your hand. They have a Chocolate Tempered meter to make sure the chocolate will have the proper gloss and shine. Dave pointed to a flexible material that has cut-outs on it to touch the coated candy and give it a decorative design or swirl on top. He also showed me the state-of-the-art metal detector that every candy piece must goes through to make sure it’s safe. “We take pride that our chocolate candies don’t have shells or pieces of material that could cause someone to send us their dentist bill,” said Chapman. 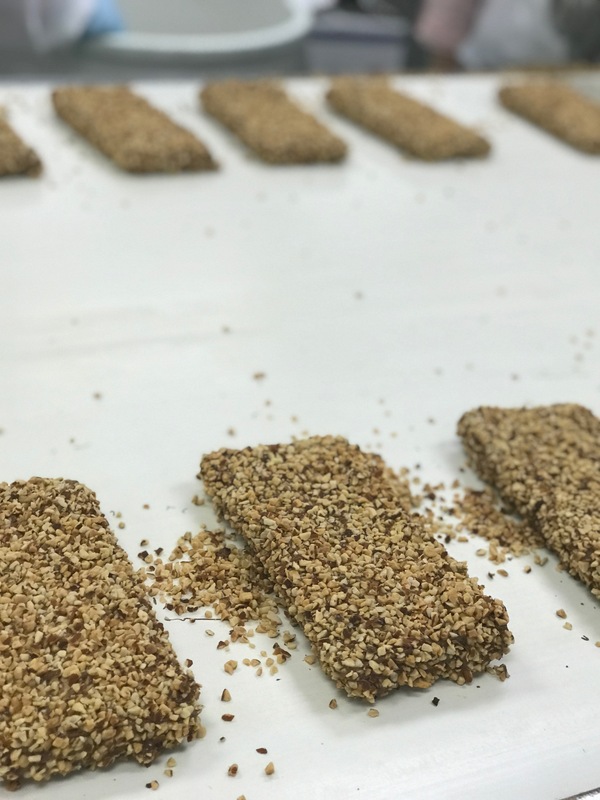 Over at the Dark Almond candy conveyor belt station, Chapman said, “This chocolate is made with just two ingredients – dark chocolate and roasted almonds.” When I asked where See’s got their chocolate, he said, “Guittard Chocolate in San Francisco. It’s a company that has been in business since 1868. We buy exclusively from Guittard. They make the chocolate to our specifications and age it, just like wine, to acquire our specific taste profile. In this room I met Juani, who has worked at See’s since 1975. Her mother worked here. too, as have other of her family members. She is an expert on making the Maple Pecan Bon-Bon. Working at a golden cauldron, she stirs the coating often, while dipping a maple center with a special metal spoon into the smooth coating. Next, she places half a pecan on top and creates a beautiful swirl. 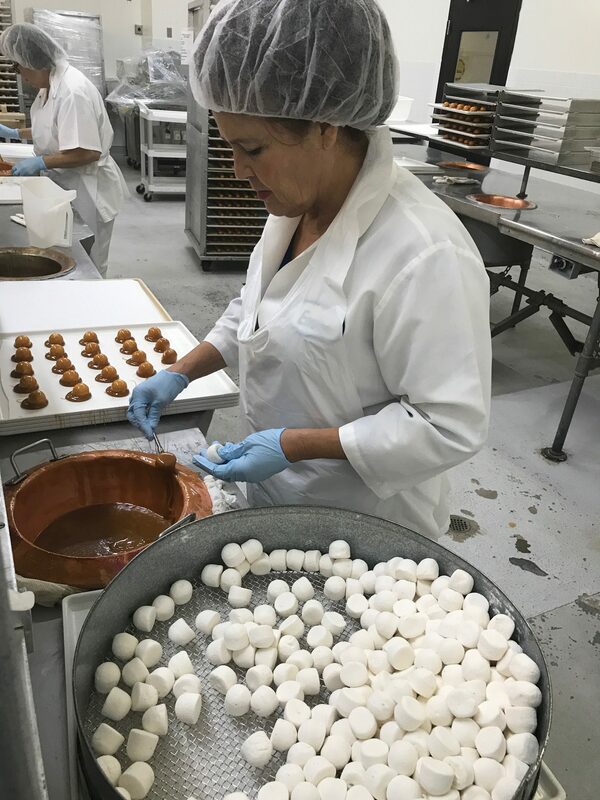 “We make five different types of Bon-Bons,” said Chapman and Juani. In addition to the maple, they make apricot, orange, coconut and a Tipperary Bon-Bon, made with vanilla caramel with chopped pecans. Another employee named Wilma walked passed us as we were stopped in the hallway near big red heart boxes. She has been working at See’s for 25 years. “Did you know you can buy a custom made heart-shape box filled with chocolates all year round? It’s not just for Valentine’s Day,” Chapman said. There is someone at the Candy facility 24/7. At 3 a.m. the supervisors come in and get the stations ready for the candy makers. The first shift is 5 a.m. to 1:30 p.m. The second shift is from 2 p.m. to 10:30 p.m. Then sanitation comes in and makes sure the areas are sparkling clean for the next morning. 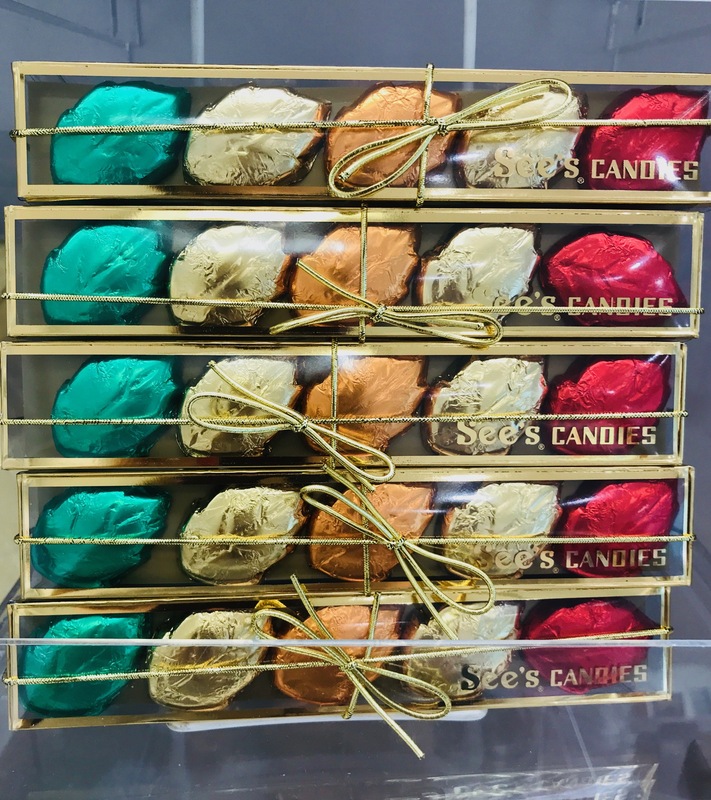 For the upcoming holidays visit See’s Candies for their colorful seasonal treats. They offer a Thanksgiving dessert in a fancy box full of rich, creamy truffles in Apple Pie, Cranberry Orange, Pecan Pie and Pumpkin Pie in two bites. They also sell pumpkin spice lollipops, milk chocolate turkeys and pretty foil wrapped chocolate leaves. 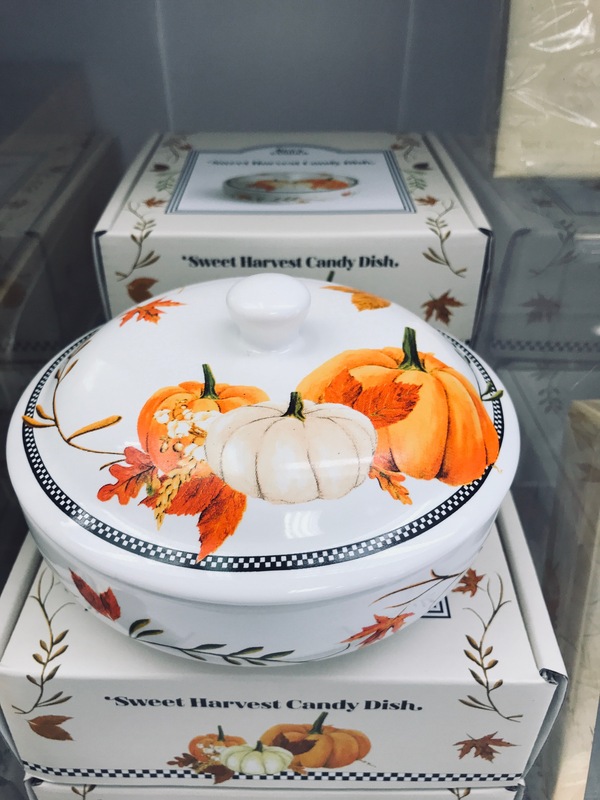 All are ideal hostess gifts, especially with the Sweet Harvest porcelain Candy Dish.